Doug Stewart & Steve Dorn using a kick net. 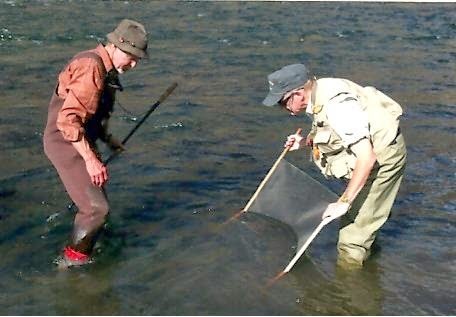 Doug (left) studying insects caught with a kick net. 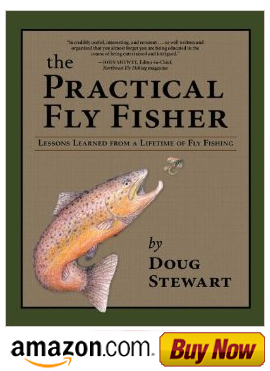 A streamside investigation of a river and its habitat with help you determine the types of flies to select and can be done without the use of collecting equipment. Start by observing hatches, looking under rocks and logs, sifting through vegetation and shaking bushes for insects. This will give you clues to the type of fly to use and their state of development. 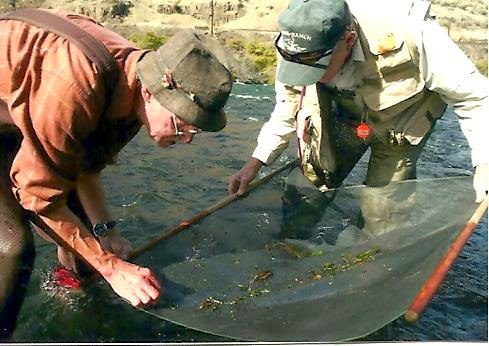 However, you can gain more thorough information by using a kick net to collect and study a stream and its inhabitants. Also, in order to collect airborne insects don't try to use your hat because it will simply blow the insects away. Instead, use aerial insect nets for this purpose.